The "National Enquirer" had access to private text messages, exposing the case of Bezos with Lauren. The story provoked his divorce with his wife, Mackenzie. Washington - Amazon chairman and CEO Jeff Bezos accused the tabloid publisher of the "National Enquirer" of blackmail on Thursday after being threatened with posting of intimate photos he sent to his mistress. The complaint comes after the tabloid reported last month that Bezos had an extramarital affair with Lauren Sanchez, a former news anchor and entertainment reporter. The publisher said on Friday it would "thoroughly investigate" the allegations. 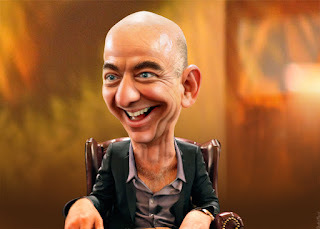 American Media Inc (AMI) said in an e-mailed statement that it "fervently believes it acted lawfully in the information on the Bezos story" and that it conducted "bona fide negotiations" with the American billionaire. Although "in the light of the nature of the complaints made by Bezos, the Board met and determined that it should investigate complaints immediately and exhaustively," the company added. In a post on the blogging platform Medium, Bezos said the Enquirer publisher, American Media Inc (AMI), led by David Pecker, threatened to publish the photographs if it did not stop investigating the motives behind the leak. According to Bezos, the publisher demanded that he and his security advisor, Gavin de Becker, who led the investigation, publicly said that "they had no knowledge, or basis, to suggest that AMI's coverage was politically motivated or influenced by political forces ". Recently, De Becker mentioned in an interview with Daily Beast that "strong evidence points to political motivations" and that he looks at the profile of Lauren Sanchez's brother Michael, who openly supports US President Donald Trump and has ties to his circle of employees, as possible responsible. In his Medium post, Bezos recalled AMI's and Pecker's prior cooperation with Trump, including payments to omit negative stories about the president, which are currently being investigated by federal prosecutors. The richest man in the world, Bezos also owns The Washington Post, Trump's permanent target. The president often uses him as an example when he attacks the press and accuses the media of being "enemies of the people" and generators of fake news. He also mentioned AMI's ties to Saudi Arabia. Crown Prince Mohamed bin Salman is named as a suspect for ordering the murder of "Post" columnist Jamal Khashoggi. Trump refused to criticize the Crown Prince.The "Post" was one of the leading American newspapers that gave more coverage to the murder. Last month, Trump mocked Bezos, calling them Jeff "Bozo," in what seemed to be an allusion to the Enquirer story. "I am very sorry to hear the news that Jeff Bozo was overthrown by a competitor, whose information, I understand, is far more accurate than his lobby newspaper, the Amazon Washington Post. ') ends up in better & more responsible hands, "he tweeted. Still in Medium, Bezos also commented on the "Post". "Ownership of the Washington Post is a factor of complexity for me. It is inevitable that certain powerful people who suffer from the Washington Post news coverage mistakenly conclude that I am their enemy," Bezos wrote. "President Trump is one of those people, obviously because of his many tweets. Moreover, The Post's essential and relentless coverage of the murder of its columnist Jamal Khashoggi is undoubtedly unpopular in certain circles." "More than giving in to extortion and blackmail, I decided to publish exactly what they sent me, despite their personal cost," Bezos wrote in Medium, under the title "No, thanks, Mr. Pecker." In the article, it included copies of emails s"I do not want, of course, to post personal photos, but I will not be part of their well-known practices of blackmail, political favors, political attacks and corruption.